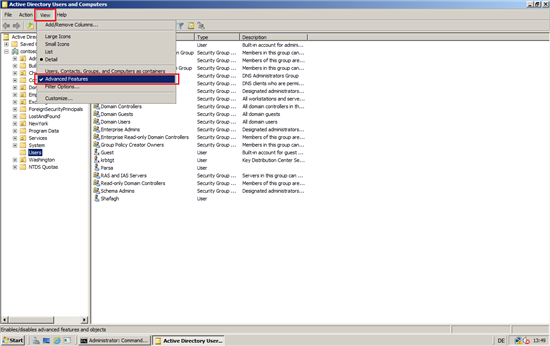 We can view the assigned permissions on an Organizational Unit (OU) in the graphical user interface, also we can use Active Directory Users and Computers console, but we must enable Advanced Features under view (Figure-1). 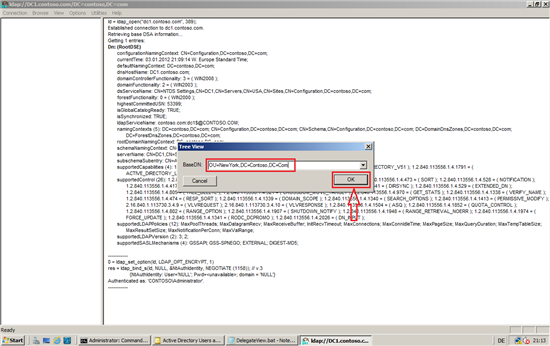 After enabled, right click on OU (for example OU=NewYork), select Properties (Figure-2). 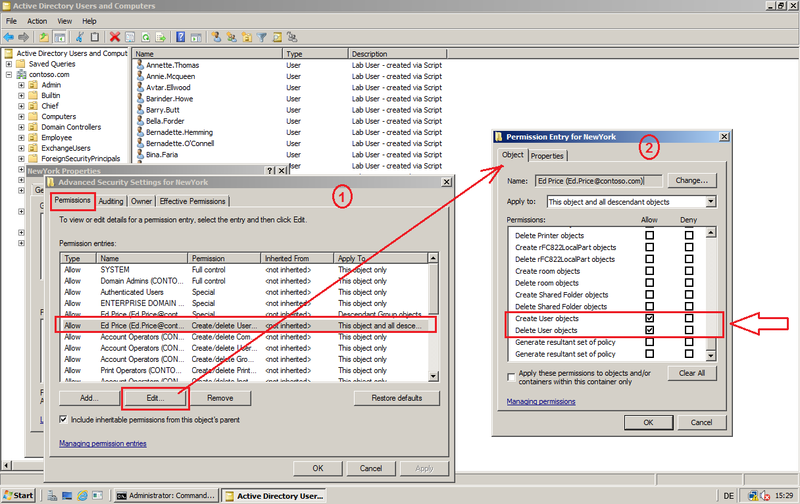 Now, select Security tab, than select Advanced button. In Permissions tab (other name is Discretionary Access Control List - DACL), you can see ACEs lists (Figure-3). 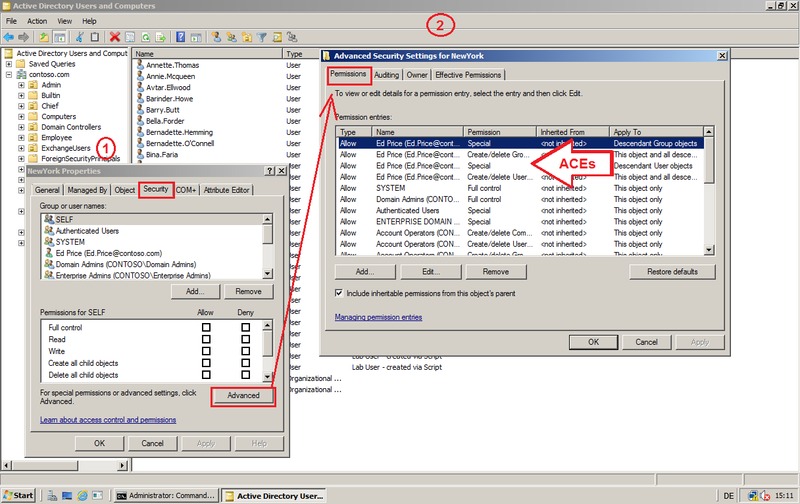 The assigned permissions can be display in the form of access control entries (ACE) with the command tool DSREVOKE and can be removed too. 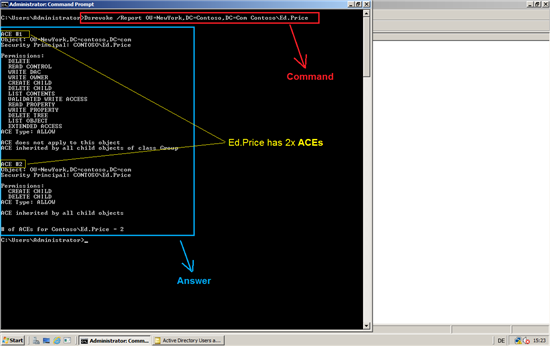 Ed.Price has 2x ACEs (ACE #1 and ACE #2). 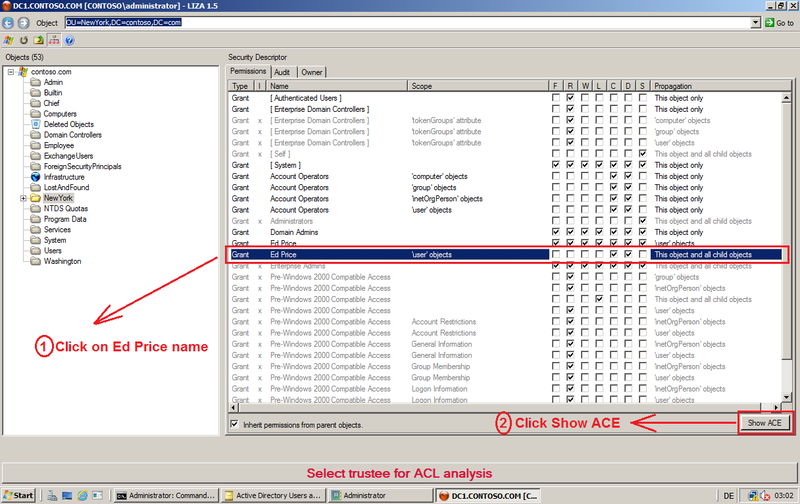 Now, for example we check ACE #2 on Active Directory Users and Computers console (Figure-5). 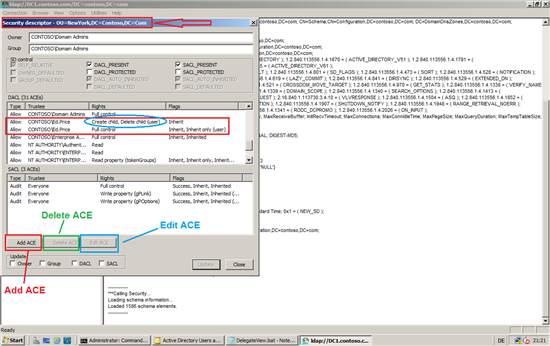 You see ACE #2 is Create and Delete User objects. 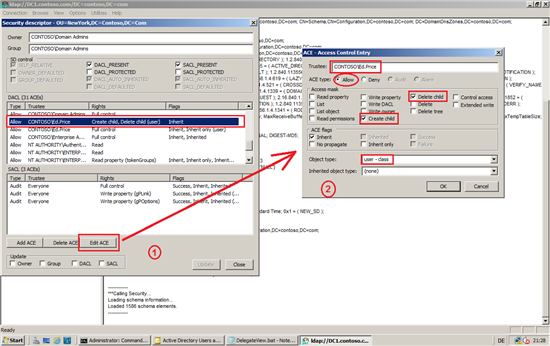 Liza is a free tool for Active Directory environments which allows you to display and analyze object rights in the directory hierarchy. You could use the tool for example to perform security permission analysis in an AD domain or the AD Configuration Partition. We can use LIZA and view Ed.Price delegated permissions on NewYork Organizational Unit (OU). 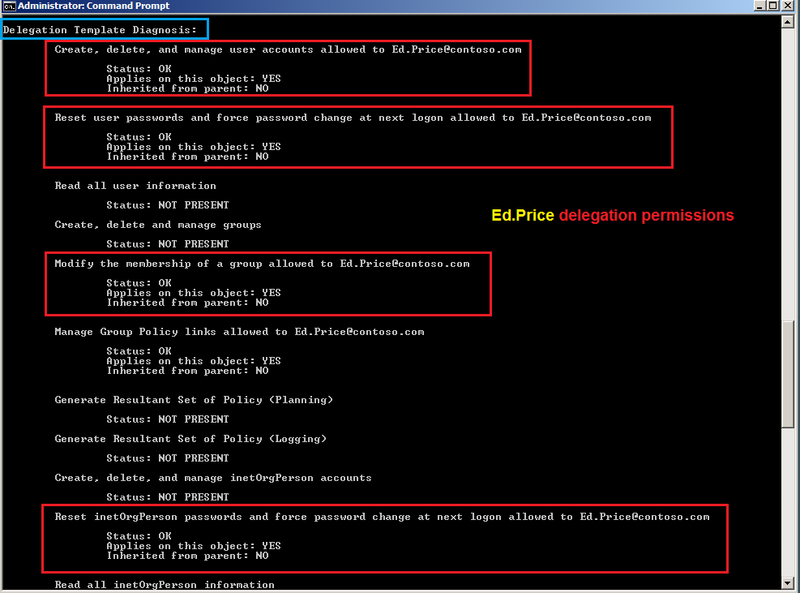 Click on NewYork OU and you can see on Security Descriptor (right site), permissions tab, Ed Price delegated permissions (Figure-7). 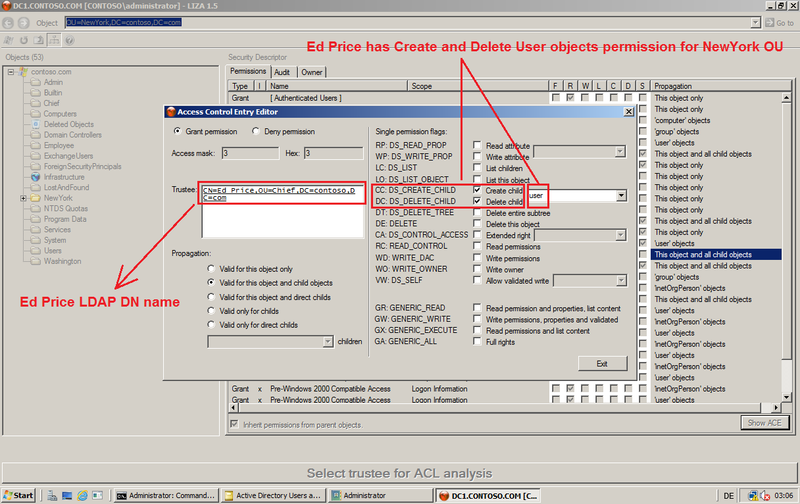 Now, we can see Ed Price has Create and Delete User objects permissions on NewYork OU (Figure-9). Sometimes we have many OUs and we only want to see that user has delegated permission to which OUs. We can use this batch file. 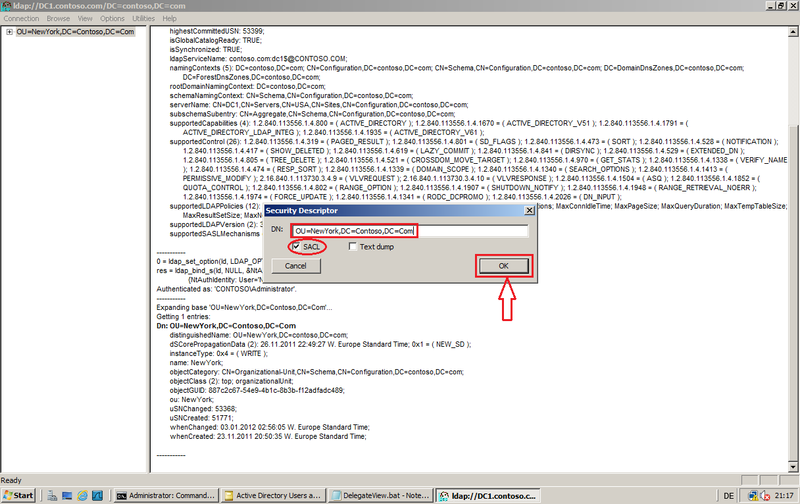 Run LDP.exe, In LDP, on the Connection menu, click Connect to connect to a domain or a specific domain controller. 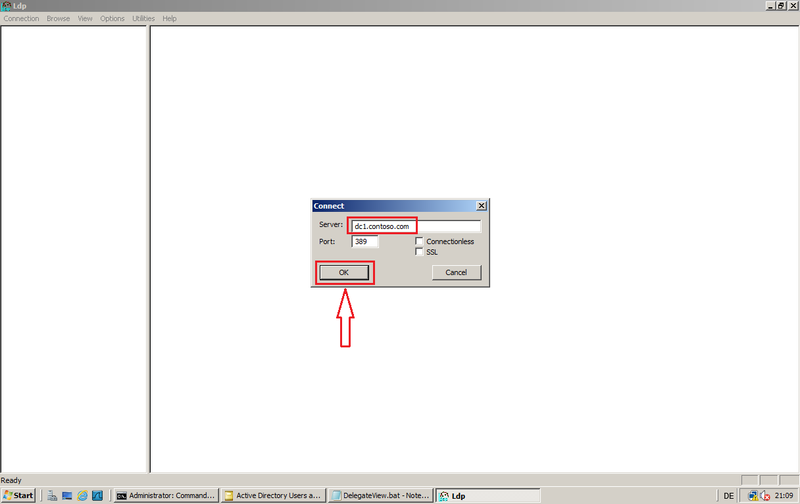 In the Connect dialog box, in the Server box, type a server name or leave the entry blank to connect to the local server, and then click OK (in my example: DC1.Contoso.Com). 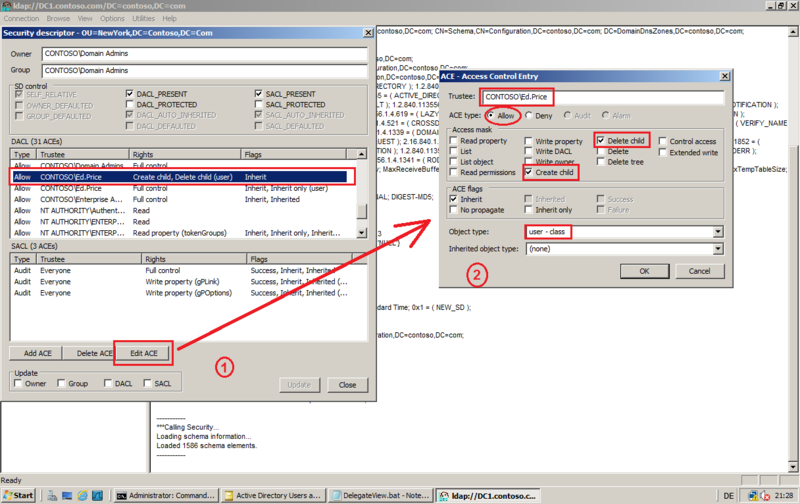 In the Bind dialog box, type a user name and password (I logged on server with Administrator), and then click OK to bind to Active Directory. On the View menu, click Tree. 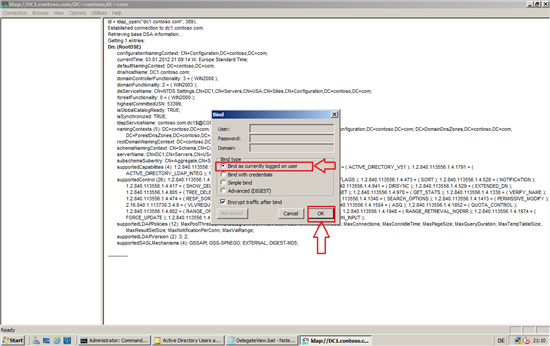 In the BaseDN box, either type a specific distinguished name (DN) or leave BaseDN blank to view the entire domain. I typed OU=NewYork,DC=Contoso,DC=Com for my example. To view the security descriptor of an OU, right click the OU in the tree view, select Advanced,select Security Descriptor, and then in the Security Descriptor dialog box, click OK.
Now, we can see Ed.Price ACEs and all other ACEs on OU=NewYork. We can Add, Delete and Edit ACEs. 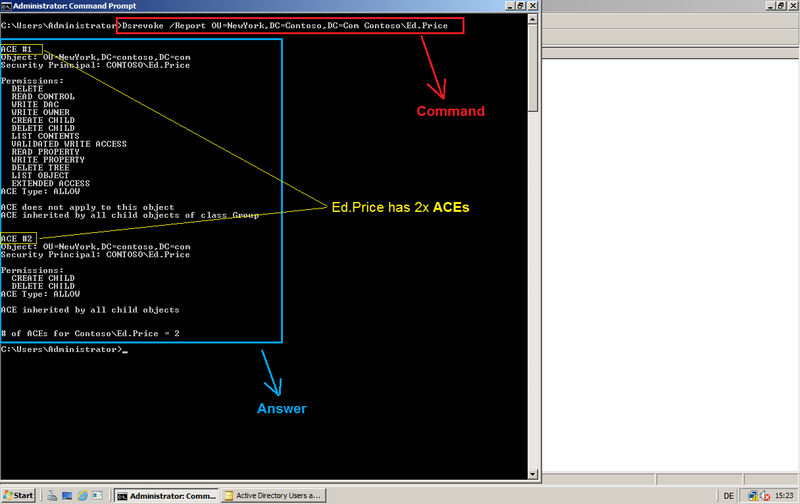 For example, I click on Ed.Price, then selecht Edit ACE button. 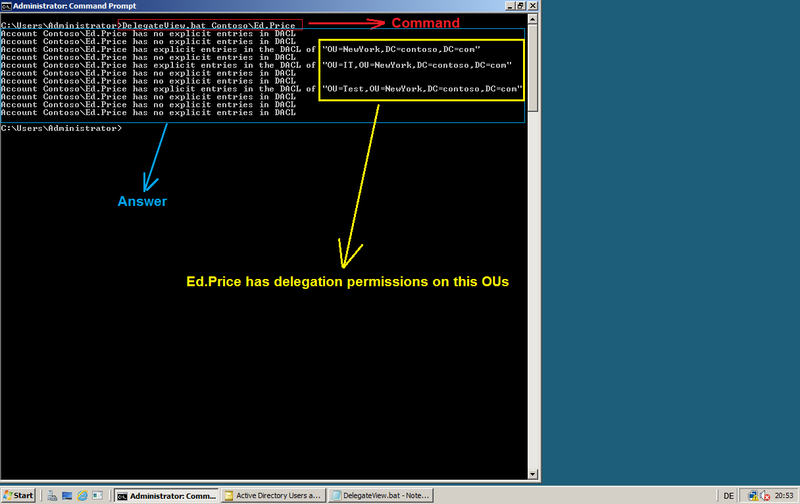 We can see Ed.Price has Create and Delete User objects delegated permissions on OU=NewYork. 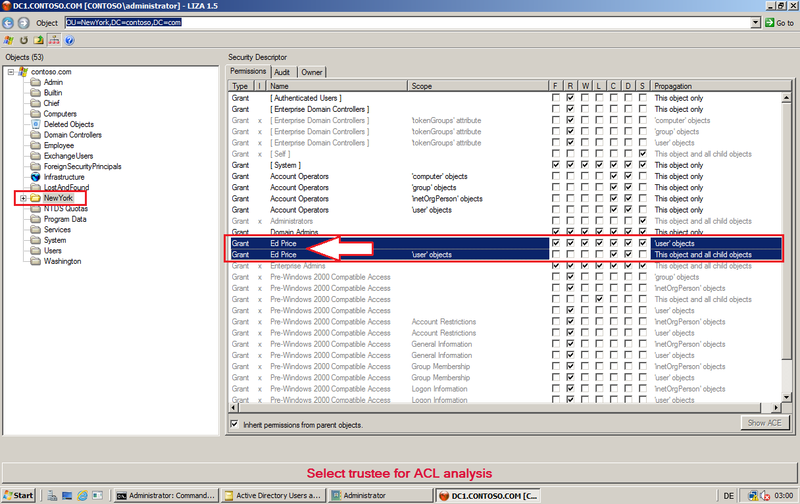 ACLDiag.exe is included in the Server 2003 Support Tools. ACLDiag.exe uses the Delegwiz.inf file to translate an object’s delegation permissions. We use ACLDiag.exe with the /chkdeleg switch. First, we look to the Delegation Template Diagnosis part. 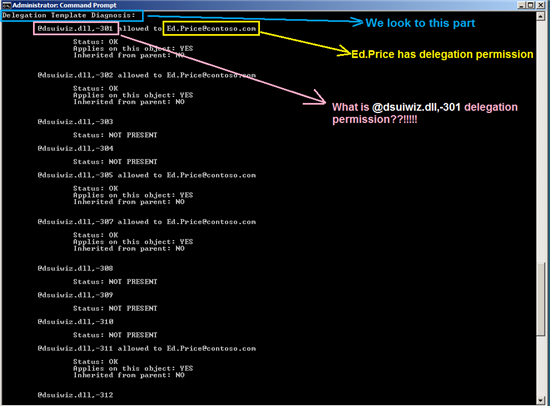 From this part, show Ed.Price has some delegation permission, but what is @dsuiwiz.dll,-301 or @dsuiwiz.dll,-302 and etc.??!!! Don't worry. I show you, what is @dsuiwiz.dll,-301 or etc. 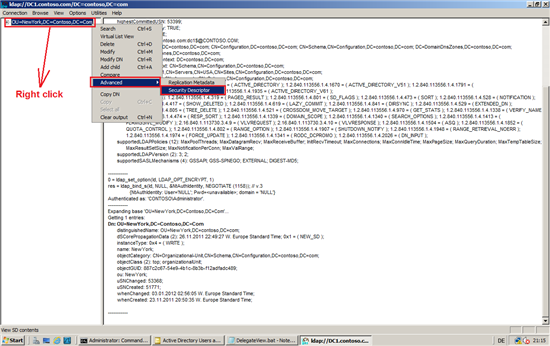 We must edit delegwiz.inf file. 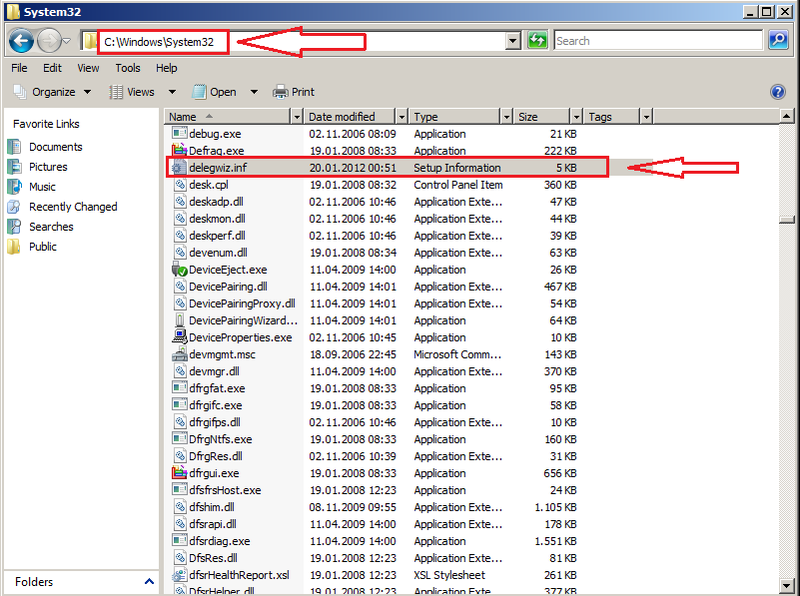 The delegwiz.inf file is located under Windows 2000 and Windows Server 2003 in the directory %windir%\Inf and Windows Server 2008 and 2008 R2 in the directory %windir%\system32. 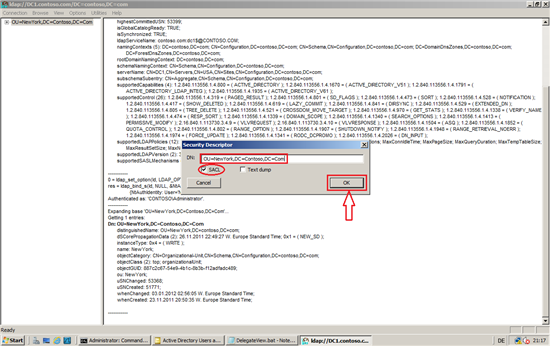 Open delegwiz.inf with Notepad (you must have permission to change and save this file). 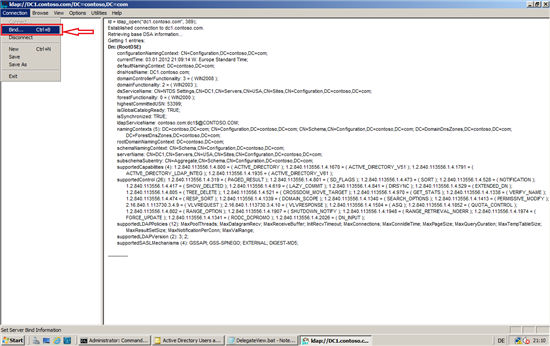 As default delegwiz.inf has 13 templates. Microsoft has released a total of 70 templates on this page (Appendix O: Active Directory Delegation Wizard File). 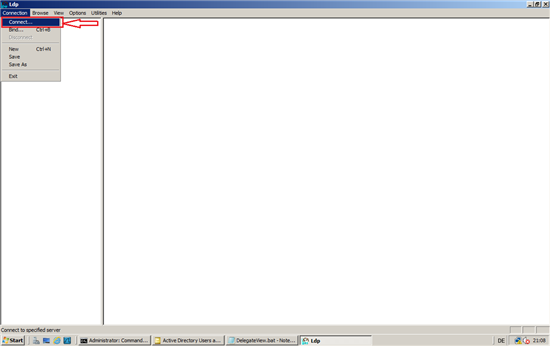 Now, you can see template1 Delegation description is Description = "@dsuiwiz.dll,-301". I remove Description = "@dsuiwiz.dll,-301" and set Description = Create, delete, and manage user accounts. Now, we can see Ed.Price delegation permission with correct descriptions. AdFind created by Joe Richards. 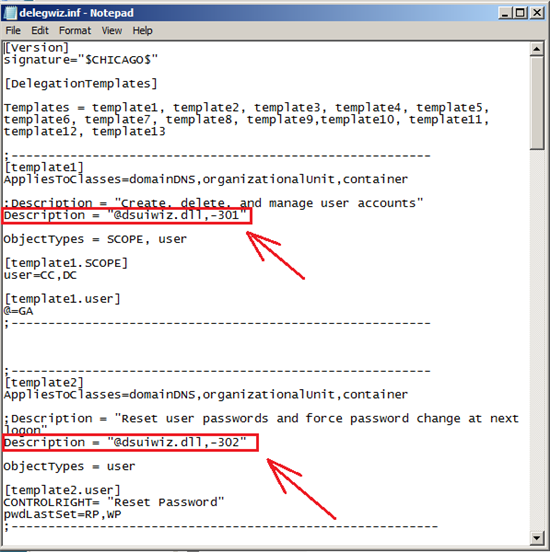 He is great Active Directory MVP and created more Free Tools here. Here is AdFind Usage and examples. 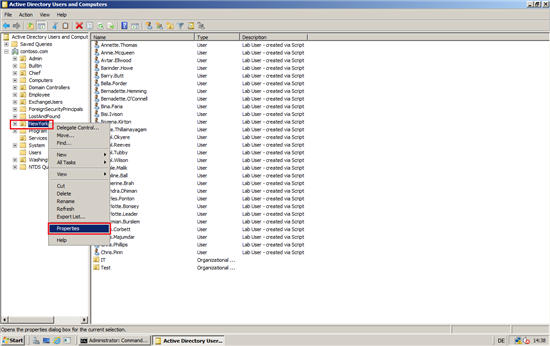 I run this command to view Ed.Ptice delegation permissions on Employee organization unit (my Domain name is Contoso.com). Scope of search. Base, One[Level], Sub[tree]. 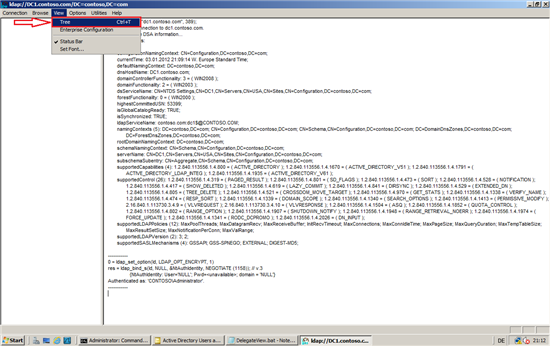 nTSecurityDescriptor is security descriptor for the schema object. Decode of security descriptors. 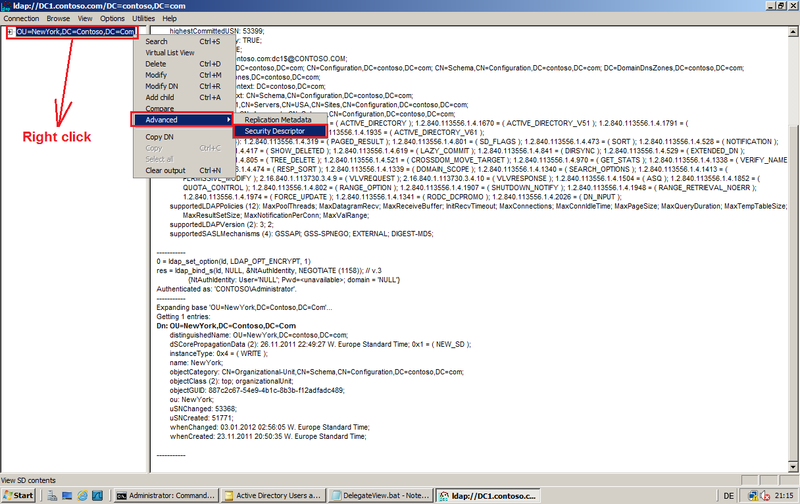 This will take an sd such as ntSecurityDescriptor and decode it to sddl. Now, we can view Ed.Price delegation permissions and all other permissions on Employee organization unit. Ed.Price has delegarion permissions on NewYork and Employee OUs. Ed.Price has specific permissions on NPS and CLIENT1 computers. 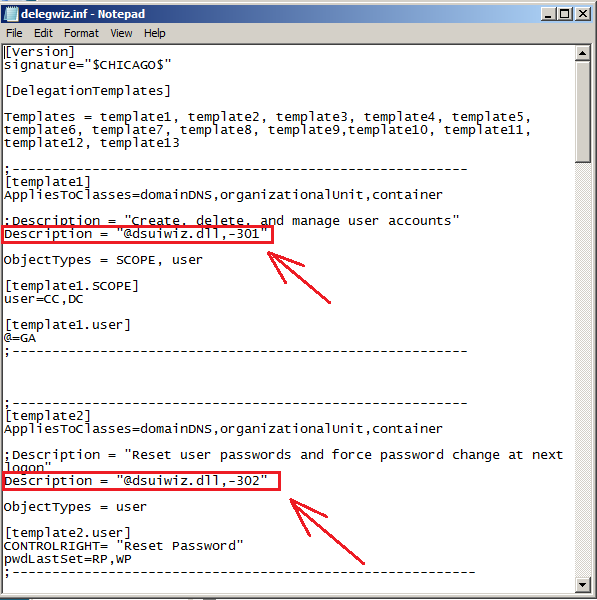 Dsacls is the other tool that we can for managing Active Directory permissions from the command line. Dsacls is part of the Server 2003 Support Tools, but from Windows Server 2008 is integrated in the operating system. 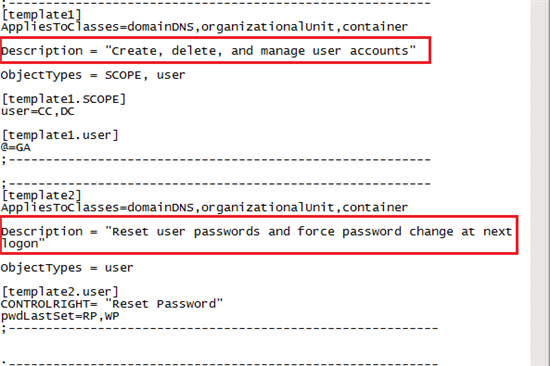 QUEST PowerShell Commands for Active Directory is the other Free tool that we can use for managing Active Directory permissions from the PowerShell command line. 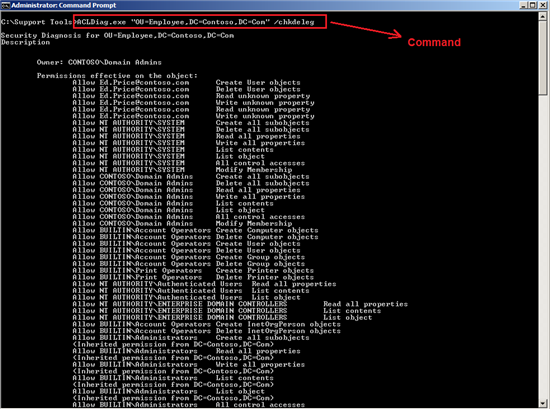 You can download QUEST Free PowerShell Commands for Active Directory from here. I used Windows PowerShell ISE in this example with QUEST PowerShell. 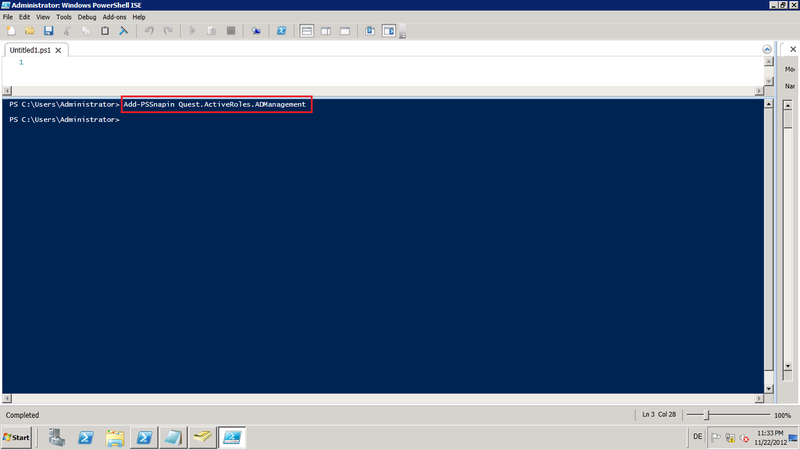 Open Windows PowerShell ISE with Run as administrator. 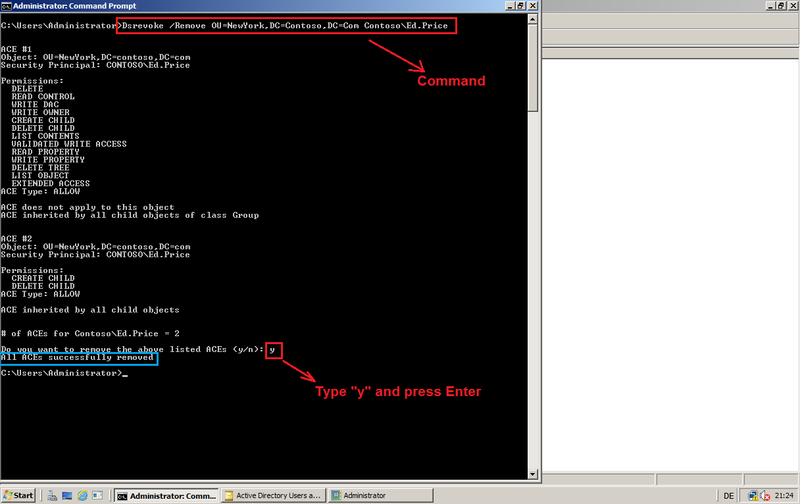 Run the following command to load the Quest PowerShell commands. As you see, a user (r.mueller) and a group (SecGlobalGroup) have delegation permission, but who is member of this group? As you see, two users (Ed Price & user 2) and a group (SecDLGroup) have delegation permission too. 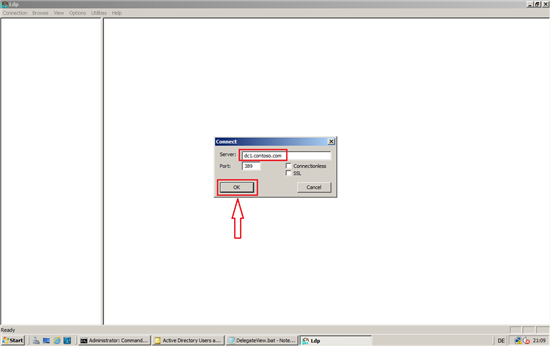 Robin Granberg (MSFT) created a great PS GUI Tool. 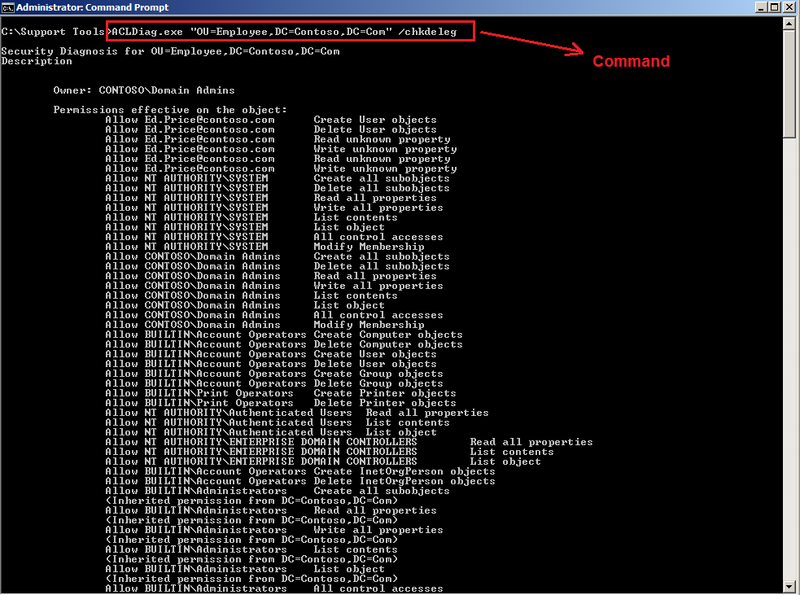 This tool creates reports of the access control list for all of your Active Directory objects. With these reports you can see what/where and when permissions have been set.